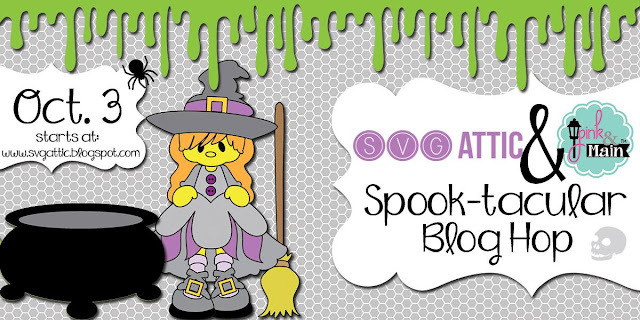 Welcome to the SVG Attic-Pink & Main Spook-tacular blog hop! We are so excited to have you join us today! At each stop of the hop we hope you will be inspired by the creativity of the design teams of SVG Attic and Pink & Main. You are sure to find many wonderful projects that will be at the top of your crafting lists! You should be arriving from Angeline's blog. If you happened across this post out of order, please head to the SVG Attic blog to start at the beginning of the hop. 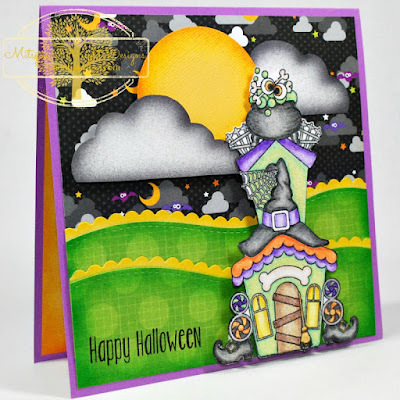 For my projects I made a card using Pink and Main's Witch House stamps set and Scalloped Waves Die for the hills. I stamped my image with Versafine ink and colored with color pencils. I airbrushed my rolling hills with my ebrush and a green sharpie marker. and for my top hat I used the Mourner's hat from the JGW Raven Quest file. Assembly was super easy on this top hat. And was totally awesome I glued it together with my Xyron Mega Runner so there was no waiting for the glue to dry!! Yay!! 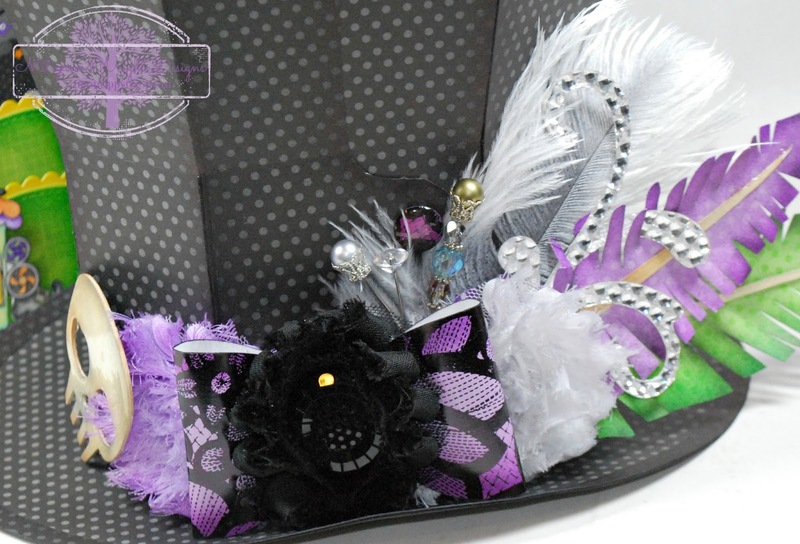 This file came with the hat, feathers, bow and the skull. I added the shabbies, ostrich feather, rhinestone flourish, and hat pins. I love making both pf these projects... I am a Halloween NUT and it is my absolute favorite holiday!! I hope you enjoyed my projects!! Now how about some blog hop prizes?? Oooooh, and by the way, SVG Attic is having an AWESOME SALE going on NOW!! You may want to stop in and check it out and buy all these wonderful files from today's hop at a bargain!! What do you need to do to be eligible for these amazing prizes? 1. Become a follower of each blog in the hop. 2. Leave some comment love at each stop. You can do so until midnight on Sunday, October 4th to be eligible for the prizes. 3. If you do both of the above, check back at the SVG Attic blog and/or the Pink & Main blog for the winners on Tuesday, October 6th. We would also love it if you would stop by the SVG Attic and Pink & Main Facebook pages and give us a "Like"! I hope you have enjoyed this stop on our hop! Be sure to head on over to the other stops for more Halloween inspiration. Comment and become a follower to be eligible for the prizes! Beautiful project, great choices of paper and embellishments. Thx. What a wonderful card. You obviously are an expert at this, and your Halloween obsession shows (in a good way). The card is so very interesting to look at. And your rendition of the mourner's hat is a real show stopper. Nicely done. Love the project, so cute! Wow! Your Mourner's hat is fantastic! I love all of the attention to detail you used on it. Your card is super adorable too! Great job on both projects - love the spooky top hat! Absolutely love love the hat!! Gasp! Then silence..... That hat is HOT!!!! Two great projects, thanks for sharing your talent! You have impressed me with your use of the ebrush. I am not that advanced, but I loved seeing your completed projects. You are an artist. Loved all the items you added to the top hat. I have that file and now have a few more ideas on how I can dress it up. Thanks. Love the hat! Your embellishments are wonderful. Amazing projects with so much fun color! Love them both and was excited to read about the ebrush too...got to check that out!!! New toys and projects are always so inspiring!!! Love all of these!! The card is super cute!! Okay...I got so excited looking back through your blog at all your fun designs I can't remember if I left a comment or not-so this might be Take Two!!! Love your designs and the bright and cheerful colors...and the ebrush is amazing...will have to check that out as well! Great fun!!! Mitsyana, your card is so darn cute but that hat??? That hat blew me away my friend!! So awesome!! Mitsyana I love your projects! I just recently made this hat and you will see it soon! I just love it! Thanks for showing me yours! Just beautiful! The hat is amazing! Love love love it! Your card is so cute and your hat is awesome!! Great job on both projects and I love that hat! 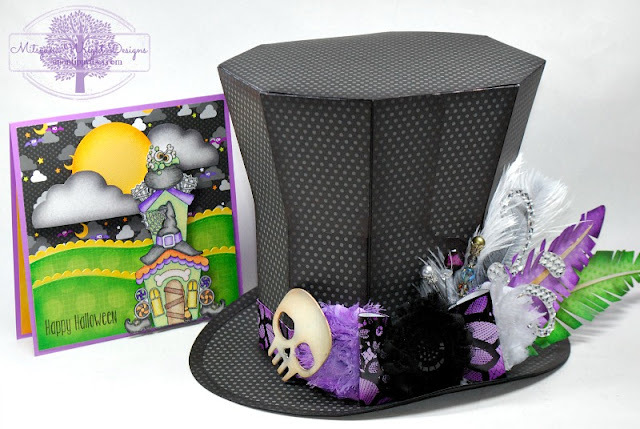 OMG...the hat is gorgeous with all of those details and love the coloring on your card! The top hat is so amazing. OMG!!!!! That hat is flippin' AMAZING!!!!! WOW!!! I love that hat!!!!! (Can you tell I am really excited about the hat?!?! LOL). But seriously, that is fantastic. And your card, I can't believe all the different elements you brought to your card. Your are one outstandingly talented Crafter Mitsyana! AWESOME Job!!!! Awesome projects! !!! I love the card! Great color combination! And the hat is spectacular! I admire your creativity! WOW!! This is AMAZING!! The hat is Outrageously GORGEOUS!! Love the super fun card!! Your creativity is truly Amazing!! Your card is beautiful. I really have to start stamping more. The hat is amazing as well. I just bought this file and can't wait to create something with it. I love the bright colors on your card! Holy smokes, what a hat! So over the top yet so perfect. Totally love the card as well. These are the cutest stamps! Love the hat and the card! the Hat is amazing and I just love the card!! I love this hat. Great use of paper to accent it. 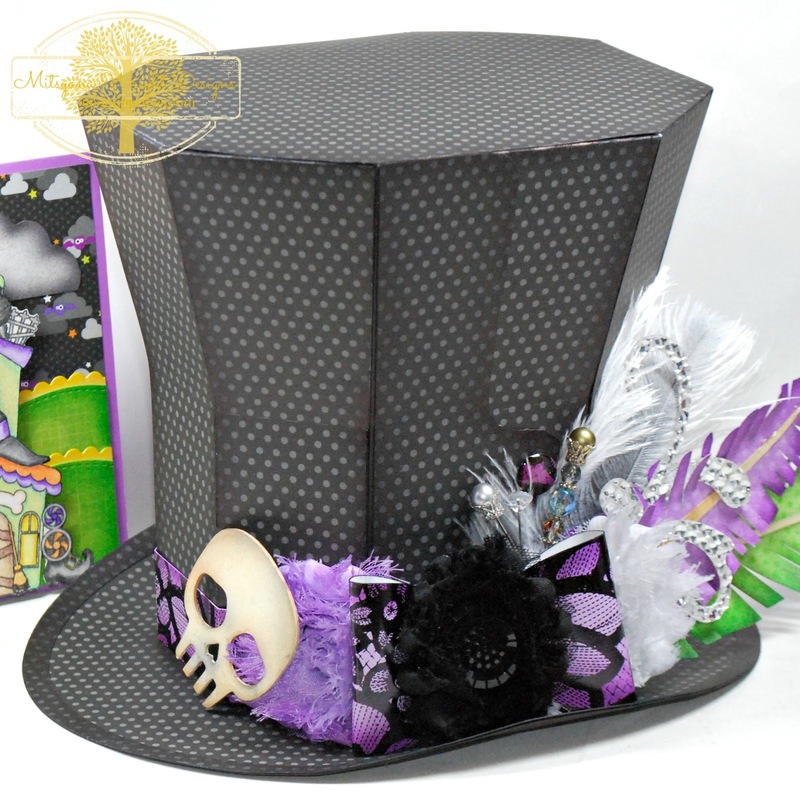 Your card is freaking fabulous and that halloween hat is amazing. Amazing! Love that hat! And the card is too cute! Great Job on all of it! AMAZING project, all the colors are so bright and vibrant!! The hat is super. Great addition to a spooky collection. THAT HAT! Oh my gosh it's amazing!! I need it! So cute. I love Halloween and fall! So many ideas and so little time! Thanks for sharing! I love this hat, awesome job! I LOVE that card you made and the hat is spooktacular! I made the same hat for spring, very versatile, for sure.